. * Required fields: An asterisk (*) are mandatory fields, and must be completed. E-mail and Mobile No: : It is important that you provide a functioning e-mail address and mobile no. 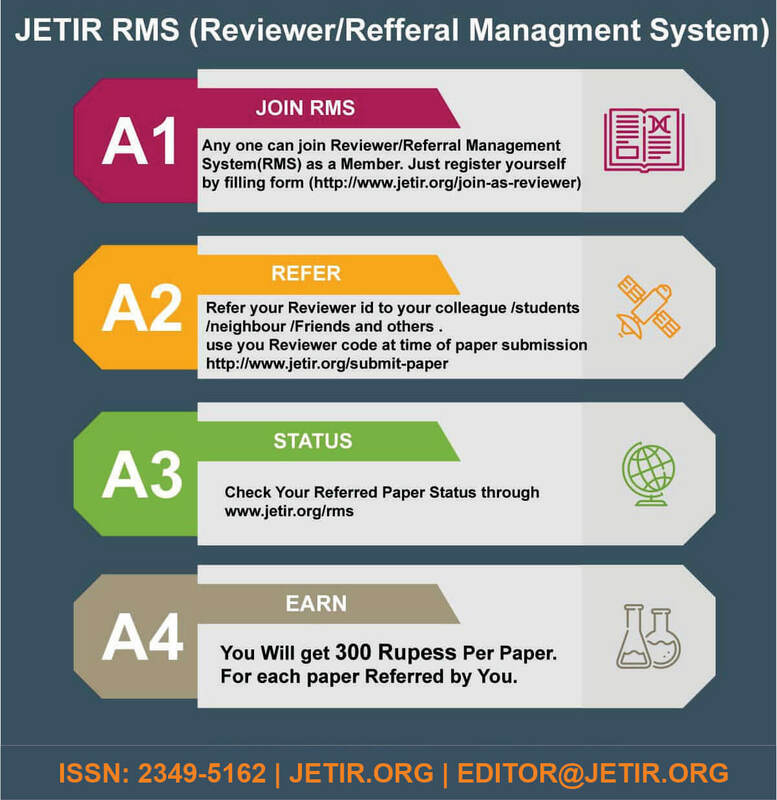 If you’re interested in honoring your knowledge and skills by supporting & promoting research activity in your University/College with the support of one of the world's leading International Engineering Journal, you’ll be pleased to know that JETIR has launched the JETIR RMS (Reviewer/Refferal Managment System). JETIR welcomes expressions of interest in joining our Representative Network, we are presently seeking new representative around the world. Who can Join: Professors/Lecturers/Existing JETIR Reviewers/Authors who would like to be considered in becoming an representative of JETIR should apply. Who can become a reviewer for JETIR? How reviewer/team member got the reward for the work they do from the JETIR? ►If you will become reviewer/team member for JETIR then you have to recommend his/her colleague/students/friends for publish the paper in JETIR then Reviewer got the Refferal amount(300 Per Paper) from the JETIR. ►Reviewer/team member have to provide his/her Reviewer ID to colleague/students/Friends When the Submit Paper in JETIR(www.jetir.org/submitonline.php). ►So when your recognized colleague/students submit the paper in JETIR for publishing at that time they have to provide the reviewer ID to JETIR. ►If your recognized colleague/student’s paper will publish successfully then JETIR team add 300 Points in your account as a reward. ►After your account contain sufficient point, JETIR will convert the reward points in currency and pay to reviewer. How to become reviewer for JETIR? ►After first step You will receive notification for submitting the request to JETIR by provided mail id. ►Then after we will evaluate your request for reviewer. ►If we accept your request then we will send the confirmation mail to you with the login credential details for Reviewer Management System. ►In mail you will be got the Reviewer ID. ►Then after you can login to our RMS System for reviewing process and recognition program. ►Member are important to us; JETIR’s RMS aims to engage Member and reward them for the work they do. ►If reviewer recommend his/her colleague /students for publish the paper in JETIR then Reviewer got the Some amount from the JETIR. ►Reviewer got the certificate from the JETIR. ►Improve your reputation and increase your exposure to key figures in the field. ►Stay up to date with the latest literature, and have advanced access to research results. ►Develop critical thinking skills essential to research. ►Advance in your career – peer review is an essential role for researchers. ►If reviewer recognize his/her colleague/student for publish the paper in JETIR then, recognized colleague/student have to complete the entire publication process till the paper publish. ►After the successfully paper published in JETIR, reviewer got the rewards point in account. Reviewer also check the rewards point in RMS account. ►You will be get 300 reward point per paper after the successfully published your recognized colleague/student 's Research Paper. ►If a reviewer has earned enough points to use them, the rewards points will appear as account credit on their account. ►Reviewer can redeem the rewards point after the he/she will got more than 500 Rewards points in account.